"Imagine if Michael Phelps or Lance Armstrong came out of the closet," writes Cyd Zeigler jr, editor for Outsports.com. As Cyd points out, the Welsh version of those sports legends, Gareth Thomas, has come out as a gay man and that has sent shock waves throughout the international sporting world. Below are just some of the headlines from around the world about Thomas's coming out story. Gareth Thomas is a sporting legend. He captained Wales in 2005 to their first Grand Slam victory since 1978. The same year he captained the British Lions tour of New Zealand. With 100 caps to his name - more than any other player in Welsh history - he has one of the fiercest reputations on the field, and a row of missing front teeth to prove it. At 6ft 3in of pure muscle, his masculinity has always been an absolute given. As a young man he bonded with rugby mates in the pub over tales of sexual conquests, and flirted with pretty girls eager to bag a sporting hero. After his marriage in 2002 to teenage sweetheart Jemma - the woman he called his 'rock' - he spoke movingly of their desire to become parents and the heartbreak of her suffering three miscarriages. And if anyone dared to suggest he was anything other than 100 per cent straight, Gareth 'Alfie' Thomas was prepared to make them see the error of their ways. With his fists, if necessary. A former international rugby star has shocked the sports world by revealing that he is gay. Gareth Thomas, Wales' most-capped player after appearing in 100 Tests, made the surprise announcement in an interview with British newspaper The Daily Mail. The 35-year-old retired from internationals after the 2007 World Cup, but still plays for Welsh provincial side Cardiff Blues. "I could never accept it because I knew I would never be accepted as a gay man and still achieve what I wanted to achieve in the game," Thomas said. "I became a master of disguise and could play the straight man down to a tee, sometimes over-compensating by getting into fights or being overly aggressive because I didn't want the real me to be found out. But when you withdraw into yourself you start to feel lonely, upset, ashamed." Rugby star Gareth Thomas has said he hopes coming out publicly will "send a positive message" to the sport. The 35-year-old wants young gay people, particularly those with aspirations in sport, to be reassured after he became the first high-profile player to announce he is gay. The former British and Irish Lions and Wales captain, a supporter of the children's charity NSPCC, said: "If it makes one young lad pick up the phone to ChildLine, then it will have been worth it." Former Wales and Lions captain Gareth Thomas has broken one of the major taboos that surround sport by revealing he is gay. The 35-year-old joins stars like basketball's John Amaechi and hurling's Donal Og Cusack who have come out. "Just because you are gay, it doesn't mean you fancy every man who walks the planet," Thomas told the Daily Mail. "I don't want to be known as a gay rugby player. I am a rugby player first and foremost. I am a man." 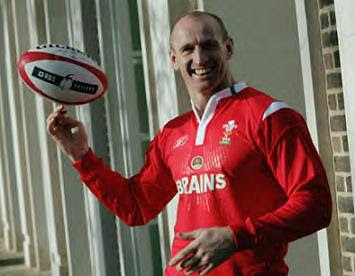 My buddies over at AfterElton.com have put together a Gareth Thomas career photo gallery; check it out here.